Have you been bitten by a partially fed tick? Every spring there are renewed concerns over the threat of Lyme disease and how best to prevent tick bites. This year, concerns are even greater after the Centers for Disease Control and Prevention (CDC) announced that blacklegged ticks, which can transmit Lyme disease, are now present in almost half of all U.S. counties. “It’s important for people to be aware that there may be ticks in areas where they haven’t seen them previously so that they can take steps to help protect themselves and their families,” lead study author Rebecca Eisen, a research biologist at the CDC, told Reuters Health. As the public takes precautions to protect themselves from tick bites, the question of transmission time arises once again. How long must a tick be attached in order to transmit the Lyme bacteria to an individual? Is it 48 hours, 36 hours, 24 or less? Many public health agencies, including the CDC, assure the public that a tick must be attached at least 36 to 48 hours. “In most cases, the tick must be attached for 36 to 48 hours or more before the Lyme disease bacterium can be transmitted,” the CDC reports. Other scientists claim that transmission can happen in as little as 24 hours. And still others report it may only take hours to become infected. Partially fed nymphal ticks transmit spirochetal infection more rapidly than do ticks that have never been attached to a host, according to 1993 study. The authors discovered it took less time for an infected nymphal deer tick to transmit Lyme spirochetes to a mouse if the tick was partially fed. Shih and Spielman demonstrated that partially fed nymphal ticks (84%) were capable of transmitting spirochetes to a non-infected mouse within 24 hours. The public may mistakenly believe that once a tick attaches it will remain attached throughout the entire feeding or until it is removed. But this isn’t the case. In the mouse study, Shih and Spielman found that ticks can spontaneously detach during the feeding process. And this action can profoundly impact the time it takes for spirochetes to infect the host. A sequence of events takes place in the partially fed tick which explains how it infects the host (mouse) much faster than an unfed tick. 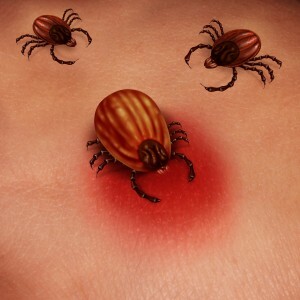 The tick attaches to a host, feeds and the Lyme bacteria multiply rapidly in the tick’s mid-gut. Normally the tick eliminates all of the bacteria, leaving behind only those spirochetes that survive in the mid-gut before they molt into an adult. The Shih and Spielman study was conducted only with mice and has not been replicated with humans. Such a study, however, would be valuable in understanding the time frame variations for spirochetal infection to humans. Shih CM, Telford SR, 3rd, Pollack RJ, Spielman A. Rapid dissemination by the agent of Lyme disease in hosts that permit fulminating infection. Infect Immun, 61(6), 2396-2399 (1993). 2 Replies to "Have you been bitten by a partially fed tick?" Thank you for this important information, Dr. Cameron. In this link is a helpful video by Microbiologist Holly Ahern who does a great job interpreting this information. Interesting findings about partially fed ticks DR C. It makes sense. The tick that infected me was only attached for 7-8 hours tops. A red-raised ring developed in 24 hours and the classic flu-like symptoms hit 4 days later with the classic stiff neck symptom on the 5th morning. Did my GP believe the tick that bit me gave me those symptoms? -no. He said the tick was “not a deer tick and we do not have Lyme in our area of the mountains.” Months passed as the symptoms escalated into the next stages. My verbal concern for myself and Lyme ignored and he became hostile towards me. Month 3, He told me I was being paranoid and that I was extremely depressed and had Fibromyalgia; he prescribed Paxil and Valium. Did he finally believe me after I demanded a blood test for Borrelia that returned a positive via ELISA? He said, “how did you know?” Put me on 2 weeks doxy….the rest is history. 18 years later still sick. Not a unfamiliar story anymore is it Dr C. Thank you for all you do for us. Physicians reading this stop denying Lyme, your’e killing us.